Item # 298208 Stash Points: 1,195 (?) This is the number of points you get in The Zumiez Stash for purchasing this item. Stash points are redeemable for exclusive rewards only available to Zumiez Stash members. To redeem your points check out the rewards catalog on thestash.zumiez.com. From Sleepy Floyd to Charles Barkley, the Houston Rockets have produced dominating players for decades within the NBA realm. The Houston Rockets Classic bracelet from Rastaclat showcases your love for a great team. 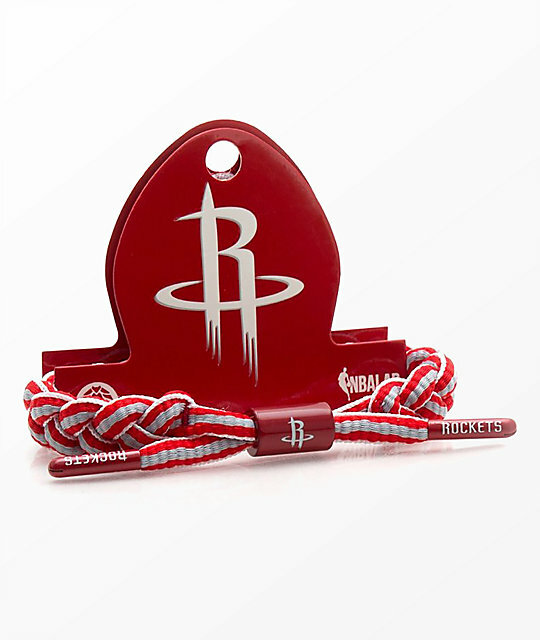 A red and white striped shoelace is braided into a bracelet and finished with a Houston Rockets team logo at the barrel sizing piece and finished with "Rockets" detailed aglets. Houston Rockets Classic Bracelet from Rastaclat. Classic red w/ white stripe throughout braided shoelace bracelet. Adjustable barrel metal sizing piece w/ Houston Rockets logo. Metal aglets w/ "Rockets" detail.